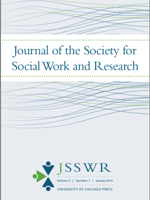 The Society for Social Work and Research (SSWR), founded in 1993, is a non‐profit, professional membership organization. SSWR supports social workers, social welfare professionals, social work students, social work faculty and researchers in related fields. If you have any questions, please contact the SSWR administrative office at info@sswr.org or 703-352-7797. Note: new, earlier abstract submission deadline is April 15. The 2020 Call for Papers is available to be viewed and can be downloaded here. Please note the new, earlier abstract submission deadline is Monday, April 15, 2019.